The web browser is another key app as far as tablets are concerned. With full Flash support, the Galaxy Tab 10.1 gets an edge over the iPad. The tabs are kept in a bar on top, much like on a desktop browser. 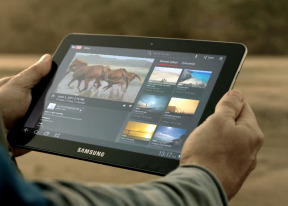 The address bar and search bar are incorporated in a single field - typical Android - which scores another point for the Galaxy Tab 10.1. Bookmarks and History have their own screen with a split-screen interface. In History you can check the pages browsed today, yesterday or over the past week. There’s also a most visited and today tabs. Synchronizing the browser with your desktop Google Chrome doesn’t need any extra software – you check a box in the settings menu and you are done. There’s also auto-complete for forms and passwords. A neat feature allows you to access quick page controls (back, forward, refresh, bookmark etc.) by a swiping gesture performed near the right edge of the screen. You cannot have that and the classical interface though so you have to pick your priorities. Now, for the Flash performance – the Galaxy Tab 10.1 does great at 360p and 480p videos right in the browser. Things are a bit more complicated with 720p Flash videos, though. You get a couple of choppy seconds at the start, but performance smooths up after that. Moving around isn't particularly fast too, but still the Flash performance is now way better than on the previous Honeycomb version. By the way, if you find Flash content to slow down your page load times or cause stutter when panning, you can switch it to on-demand in the settings menu (or even turn it off all together). A good set of organizer apps are available on the Samsung Galaxy Tab 10.1, including the Polaris Office that can both view and edit documents. It has really nice user interface with 3D arcs for the recent docs, internal file browser, intuitive interface, etc. It supports both internal and web storage (via Box.net). Viewing and editing all kind of doc, sheet and presentation is hassle-free. You can also read PDF files, but naturally you can't edit them. Printing options are also available. When you think of organizer features on a smartphone (or tablet) the first app that comes to mind is the calendar. It has five different types of view: daily, weekly and monthly. Adding a new event is quite straightforward and you can also set an alarm to serve as a reminder. The calculator app is nicely touch optimized with huge, easy to hit buttons. The Alarm app is optimized for big-screen use and is pretty intuitive. You can naturally set as many alarms as you like. The World Clock app is full of eye-candy. You get an animated globe where you can pick time zones or cities, there are country flags, day and night animations, etc. Once you try it, you'll definitely like it.